Creatine is made from amino acids, and it is produced in the body by the liver and kidneys. It is also present in foods of animal origin, particularly meat, and the diet is a significant creatine source for most people. The average person has about 120-140g of creatine in their bodies, stored mainly within the skeletal muscles. Creatine has been extensively studied and is consistently associated with increases in strength, power, endurance, overall performance and muscle size amongst study participants (1). In spite of these results, there are some people who do not experience any ergogenic changes as a result of creatine supplementation. It is commonly estimated that about 20% of the population are "Creatine non-responders". 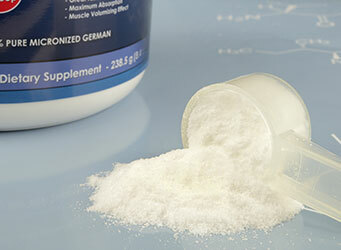 There have been many reasons put forth for the varying responses to creatine in the population. One of the most obvious of these is that once muscles are saturated with creatine, adding more will not produce any further effect. People who obtain a lot of creatine from their diets, for example, someone who ate a lot of meat, would theoretically see less of a change after supplementation than, for example, a vegetarian (2). Other characteristics common to non-responders include a low proportion of type II muscle fibres, a lower fat-free mass, and low muscle cross sectional area (3). While there are a number of biological variables that determine individual response to creatine, the way creatine is taken may also have an effect on response. Let's have a look at some of the common questions about taking creatine. Creatine monohydrate is notoriously difficult to dissolve in cold water, and a lot of people get around this by mixing their dose in with warm caffeinated drinks like coffee or tea. Creatine is also present in a lot of pre-workout formulations that also contain caffeine. So does caffeine inhibit creatine? Thi idea has gained a lot of traction, despite there being evidence to the contrary. A single study performed in 1996 showed that athletes supplemented with creatine alone displayed greater intermittent contractile force than those who had taken creatine with caffeine, however caffeine did not affect creatine absorption into the muscles (4). Many other studies have since come out with conflicting results, showing that creatine + caffeine outperforms creatine alone for cardiovascular exercise (5) and high-intensity anaerobic muscle performance (6). It is now widely accepted that caffeine and creatine are a good team, and that stacking these can improve performance. Although creatine and alcohol are not dangerous together – creatine is naturally found in food, after all – There are a couple of reasons that alcohol and creatine do not mix. Firstly, alcohol inhibits muscle growth. A major reason for taking creatine is to work harder in the gym and to see those results. A study showed that even with protein supplementation, alcohol consumption suppresses the anabolic response to training and impedes recovery and muscle protein synthesis (7). Secondly, creatine causes water retention, whilst alcohol suppresses anti-diuretic hormone (ADH). This is why drinking alcohol causes excess urination and dehydration. Creatine is stored in the muscles alongside water, so people supplementing with creatine have more water to lose. Losing this extra water can mean greater potential for a killer hangover, and research shows that the pressure from the water retention in muscle cells stimulates muscle growth factors (8). The good news is having the odd drink shouldn't cause any problems, as long as you stay hydrated and drink in moderation. A common way to take creatine, especially for people avoiding carbs, is to mix it straight into water. Creatine is quite soluble in water, and degradation is slower at higher pH levels found in water, as opposed to juice, which is more acidic (9). While insulin is known to enhance the uptake of creatine into the body, many of the early studies into creatine used water as a mixer and offered ample proof of creatine's effectiveness in this liquid (10). If you are mixing creatine with water and not responding, however, switching to juice, or stacking the dose with carbs, is something worth trying before giving up on creatine. With a sugar content that promotes insulin release, enhancing creatine uptake, juice is an excellent mixer for creatine. Because creatine does dissolve poorly at lower temperatures, dissolving creatine in a small quantity of warm water and adding this to juice is a way to maximise effectiveness and prevent the stomach upsets that can be caused by incomplete mixing. Stick to low acid juices like grape for the best results. Although there is some resistance to the idea, creatine and milk can be a good mix, however it pays to note that milk has a low glycaemic compared to juice. This means that it will not create as large an insulin spike. While this should not impede the absorption of creatine, if you are not responding to creatine, it might be worth switching to juice, or flavouring the milk with a sugar-based product to determine whether this changes. As mentioned above, cold milk may affect the ability of the creatine to dissolve. Tossing a scoop of creatine into a protein shake is an easy way to get both nutrients at once. While taking creatine alongside a large, protein rich meal will probably impede absorption of creatine, taking creatine with a protein shake is unlikely to inhibit absorption of either nutrient. Depending on the sugar content and GI of the shake, creatine absorption may actually be enhanced. (1) Bemben MG, Lamont HS. Creatine supplementation and exercise performance: recent findings. Sports Med. 2005;35(2):107-25. (2) Demant TW1, Rhodes EC. Effects of creatine supplementation on exercise performance. Sports Med. 1999 Jul;28(1):49-60. (3) Syrotuik DG1, Bell GJ. Acute creatine monohydrate supplementation: a descriptive physiological profile of responders vs. nonresponders. J Strength Cond Res. 2004 Aug;18(3):610-7. (4) Vandenberghe K1, Gillis N, Van Leemputte M, Van Hecke P, Vanstapel F, Hespel P. Caffeine counteracts the ergogenic action of muscle creatine loading. J Appl Physiol (1985). 1996 Feb;80(2):452-7. (7) Parr EB, Camera DM, Areta JL, Burke LM, Phillips SM, et al. (2014) Alcohol Ingestion Impairs Maximal Post-Exercise Rates of Myofibrillar Protein Synthesis following a Single Bout of Concurrent Training. PLoS ONE 9(2): e88384. (8) Olsen, S.; Aagaard, P; Kadi, F; Tufekovic, G; Verney, J; Olesen, JL; Suetta, C; Kjaer, M (2006). "Creatine supplementation augments the increase in satellite cell and myonuclei number in human skeletal muscle induced by strength training". The Journal of Physiology 573 (2): 525–34. (9) Ganguly S1, Jayappa S, Dash AK. Evaluation of the stability of creatine in solution prepared from effervescent creatine formulations. AAPS PharmSciTech. 2003;4(2):E25. (10) McCall W, Persky AM. Pharmacokinetics of creatine. Subcell Biochem. 2007;46:261-73.